Allow our timeless island beauty to surround and entertain you all while immersing yourself in all that is Le Meridien Bora Bora. 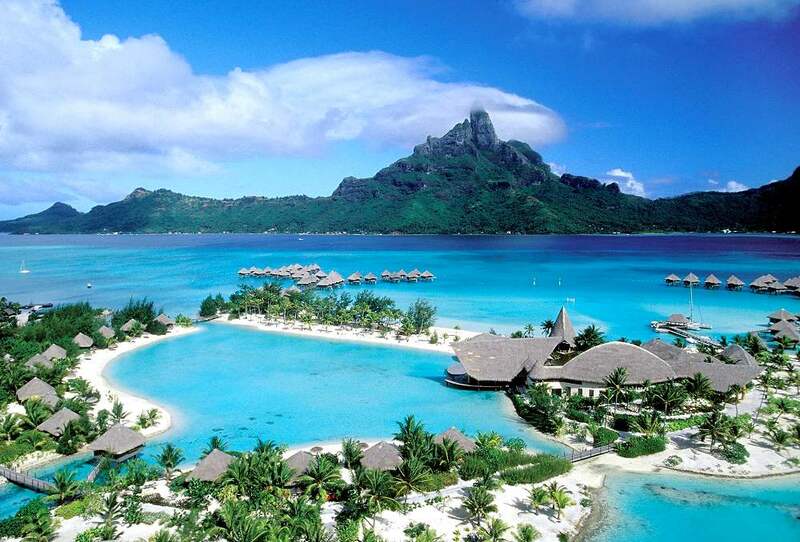 Bora Bora is a small island thick with coconut forests and colorful villages and surrounded by miles of fine, white sandy beaches and crystal clear, turquoise water as far as the eye can see. One of the most original and intriguing hotel complexes on the island, Le Méridien Bora Bora is located on the southern point of Motu Piti Aau, a 10-kilometer-long islet on a coral reef. The resort offers unsurpassed views of world-renowned Mount Otemanu - at 725 meters, it is the island's highest point. Photo copyright Starwood Hotels & Resorts Worldwide, Inc.
Video copyright Starwood Hotels & Resorts Worldwide, Inc. Welcome and "Ia Orana" to Le Méridien Bora Bora...Completely renovated in 2010 in a contemporary and elegant design, this luxury resort is set on a magnificent islet surrounded by the most beautiful lagoon in the world and offers stunning sights over Mount "Otemanu". Only 20 minutes from the airport the resort is only accessible by boat. Regular shuttles brings you to the main island in only 5 minutes. The resort offers a combination of outstanding bungalows and villa suites, from beach or lagoon bungalows to the most romantic over-water bungalows featuring a large glass floor with amazing views of the lagoon and its marine life. All bungalows have chic and modern furniture, full facilities and the flavour of the Polynesian culture. For more intimacy, explore our pool beach suites or indulge yourself in the pool beach villas, offering 2 rooms and a private infinity pool overlooking the inner lagoon of the resort. For delight cuisine and culture, the hotel recommends its buffet restaurant at "Le Tipanier", its lovely decor with sandy bottom floor at the restaurant "Te Ava" or its finest gourmet "a la carte" at "Le Tiare" joining Polynesian and international flavour. Discover the turtle sanctuary at Le Méridien Bora Bora, home to numerous marine turtles. This center works in an environmental effort to protect the species and the resort is proud to add its contribution in saving them.